We’ve probably all felt like this baby dinosaur has felt at one time or another. Sometimes when waking up we just want to crawl back under the covers and not have to deal with the mundane tasks and pressures of a new day, or when faced with meeting new people we just want to crawl back under our “shell” where it is comfy and familiar. Whoa! That’s getting a little too deep there, and a little too serious for this episode that is simply dealing with Gralen and Jenny’s new baby who, seeing the people he is going to be living with for at least the next 18 years, decides he likes the looks of things better in his egg. I think he must have put a lock on that egg, because their baby is never seen or mentioned again after this episode. Apparently he was a one-joke baby because I never used him/her again. Note: If you haven’t noticed, my pen name has been skillfully added to this comic strip episode due to my real name being on the paper(I used the photo fixing software called Pixlr, btw). Oh well, it’s the best I could do. It is not that easy to match the color of old, yellowing notebook paper for some reason. 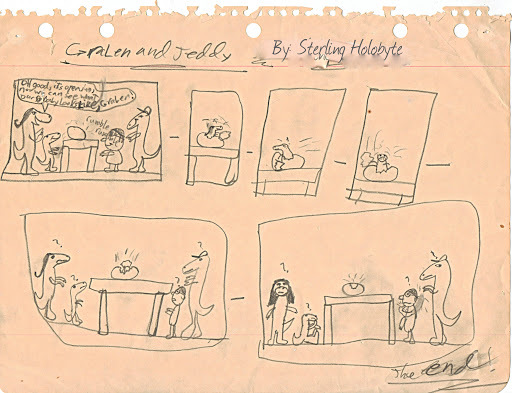 This entry was posted in cartoon, dinosaur, egg, gralen and jeddy, jenny, jessy, original, paper, shell. Bookmark the permalink. Gralen and the all-over tan.